Jerry Harston was an illustrator whose work served many national companies and members of The Church of Jesus Christ of Latter-day Saints, of which he was a member. Harston earned a Bachelor of Fine Arts degree from the University of Utah. He illustrated over thirty children’s books and Golden Book, New York, published a children’s book he both wrote and illustrated. 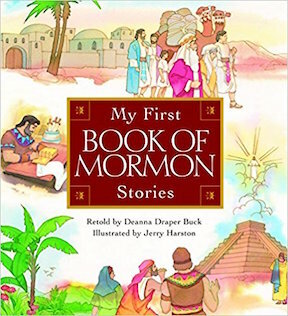 He illustrated My First Book of Mormon Stories, My First Church History Stories, My First Scripture Stories, More of My First Book of Mormon Stories, My First Old Testament Stories, My First New Testament Stories, My First Articles of Faith Book, and My First Story of the First Christmas—all written by Deanna Draper Buck. He also illustrated the Believe and You’re There series (When the White Dove Descended, At the Miracles of Jesus, When the Prince of Peace Was Born, When the Stone Was Rolled Away, When Lehi Left Jerusalem, When Ammon Was a Missionary, and When the Night Stayed Bright as Day, by Alice W. Johnson and Allison H. Warner). He was born on March 9, 1943, and passed away on December 12, 2009. He and his wife, Elizabeth (Libby) Jensen Harston, are the parents of six children. This page was last edited on 17 February 2018, at 21:41.